This can be set in individual glasses, a cut glass bowl or a jelly mould. If you would like to add fruit, drop a few raspberries in just before the jelly sets. John Lewis sells jelly bag kits that clip on to the bowl. Place the sliced strawberries in a large, heat-proof bowl. Cover with clingfilm and set over a pan of simmering water. Cook for 45 minutes, stirring occasionally, until the strawberries release all their juice. Suspend a jelly bag, or a large sieve lined with muslin, over a large bowl. Fill with the strawberry mixture and leave to drip. Discard the flesh and measure the juice. Add the lemon juice, Cointreau and enough water to make 550ml. Pour into a saucepan and add the sugar. Break up the gelatine and place in a small bowl with 3 tablespoons of water. Leave to soak for 5 minutes. Gently heat the strawberry juice, making sure that the sugar has dissolved. Once piping hot, add the soft gelatine and stir until it has melted. Do not let the gelatine boil. 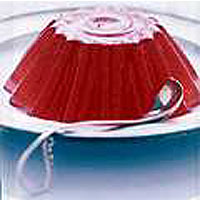 Rinse out your jelly mould, then fill with the strawberry juice. Once cold, chill until set. Turn out by dipping the mould for a few seconds in a bowl of hot water. Invert onto a serving plate and give a sharp shake. Serve with a jug of cream.